Have you tried every possible crash diet, hit all the famous and expensive gyms and still not able to lose weight? Did you ever think that less sleep or disturbed sleep is to be blamed for your weight gain? Surprised? Read below to know how sleep and healthy body weight are connected. Early to bed and early to rise makes you healthy, wealthy, and wise. The probable explanation to weight loss while sleeping could be due to changes in the amount of body water during those late night hours. The process of exhalation (respiration) and transpiration (sweating) especially during night time eliminates quite a bit of water from the body. An interesting fact is also the functions of hormones like ghrelin and leptin, the hormones that control our hunger and satiety. The activities of these hormones are influenced by how much or how little we sleep. When we sleep less, the level of the hormone ghrelin rises, increasing our appetite. Insufficient sleep also brings down the level of the ‘satiety hormone', leptin which is responsible to make you feel full even after eating a meal. The two combined, will make you eat more which causes weight gain. Researchers also concluded that people with sleep apnea (the flow of air, pauses or decreases during breathing while you are asleep because the airway has become narrowed, blocked, or floppy) are more likely to be overweight or obese as they have low leptin levels. The much hyped, 'basal metabolic rate' is also known to drop with sleep deprivation, which in turn will slow down the process of weight loss. To sum up, on an average, we need about 7.5 hours of good quality sleep. If you are already getting this, another half-an-hour will not make you shed kilos. If you wake up tired or sleepy on a regular basis, it is time to visit a sleep therapist to get your sleep apnea or insomnia corrected. Avoid caffeine post 2 pm and prefer a light and early dinner to improve your sleep quality. 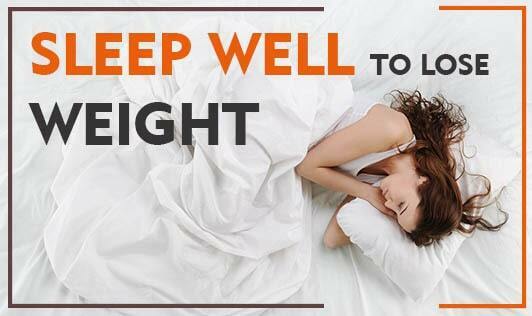 You deserve good quality sleep along with regular exercise and a balanced diet to shed those extra kilos!